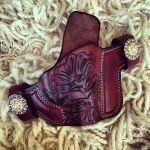 The 'Live Free or Die' Hand Tooled Leather OWB Holster by Soteria Leather is the 'Thrasos with Body Shield' custom holster, featuring a beautifully done hand-tooled design. The following information can also be found for the 'Thrasos with Body Shield'. The 'Thrasos with Body Shield' Custom OWB Holster is a favorite handgun holster because of the holster belt straps and the body shield comfort. The straps that wrap around your belt are small, but durable, thus ensuring that your concealed gun will not be seen. This handgun holster can be easily concealed with a loose outer garment, a t-shirt or a jacket. The body shield covers the back of the handgun, the hammer, and the back sight. The body shield is a good option if you are wearing a garment that you do not want the handgun to rub against. 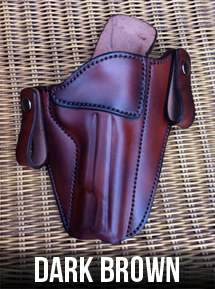 The Thrasos outside the waistband gun holster is constructed of leather from American cattle. 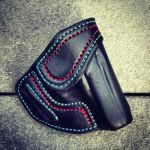 Make this 'your' custom concealed carry holster. 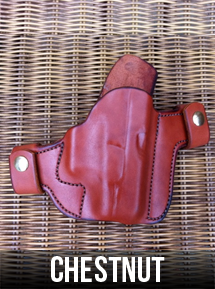 This pistol holster comes in Right Hand and Left Hand designs. Choose from three leather color options. Choose from twenty-six thread colors. This concealed carry holster will fit a 1-1/2" gun belt. 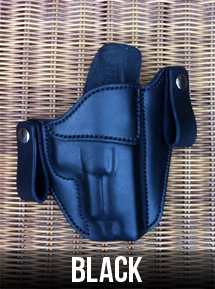 The Thrasos custom concealed gun holster is made in the USA. Your custom-made hand-tooled gun concealment holster will ship in eight to eleven weeks. This custom engraved leather gun holster is available for the following weapons. Kimber SOLO, 1911 3.5", 1911 4"
Springfield EMP, XDM Full Size 9, XDM Full Size 40, XDM 3.8"